Mix one packet per day with cool or room temperature water, other beverage, or soft food immediately before use. Do Not mix with hot beverages or food. Vegetable capsules (vegetable fiber and water), cellulose. Adults take 1 capsule daily, with our without food. Keep refrigerated. Keep out of reach of children. Consult your physician before using this or any product if you are pregnant, nursing, trying to conceive, taking medication or have a medical condition. Made in a facility that handles wheat, gluten, soy and dairy. Individuals extremely sensitive to these ingredients should consult a physician prior to using this product. Vegetable capsule (vegetable fiber, water) and cellulose. For best results, take one (1) capsule daily, with or without food. Best if refrigerated. Renew Life Ultimate Flora Critical Care 50 Billion is the highest quality probiotic supplement currently on the market. Each batch of Ultimate Flora Critical Care 50 Billion is tested to ensure live probiotic strains, not “dead-biotics” like the dead cultures found in so many other probiotic supplements. Customers know that the most important factor when choosing a probiotic supplement is quality. What’s the benefit in taking a probiotic supplement if what you’re taking isn’t alive and flourishing? Ultimate Flora Critical Care 50 Billion makes this concern their number one priority and ensures successful delivery of 10 different probiotic strains totaling 50 billion active cultures per pill, plus prebiotic fructooligosaccharides (FOS) to encourage healthy probiotic activity once in the digestive tract. If you’re looking for the highest quality probiotic supplement to benefit your digestion, look no further than Renew Life Ultimate Flora Critical Care 50 Billion. Age, poor diet and stress can deplete our bodies of billions of good bacteria, which can lead to digestive upsets such as occasional constipation, gas and bloating. Probiotics are the healthy cultures or "friendly bacteria" inside us that help us digest and produce nutrients, restore digestive balance, and support our immune system. Ultimate Flora Critical Care 50 Billion is formulated for people with troublesome digestive tracts who experience occasional constipation, gas and bloating, or digestive discomfort. It is designed to support the probiotic balance in both the small and large intestines. Each capsule contains 30 billion live Bifidobacteria, the primary beneficial bacteria found in the healthy large intestine, and 20 billion live Lactobacillus, most prevalent in the healthy small intestine. Is Critical Care 50 Billion for You? Do you have occasional constipation? Do you experience occasional gas and bloating, or digestive discomfort? Are you looking for a high Bifido probiotic formula? If your answer is yes to one or more of these questions, Ultimate Flora Critical Care 50 Billion may be a good choice for you. 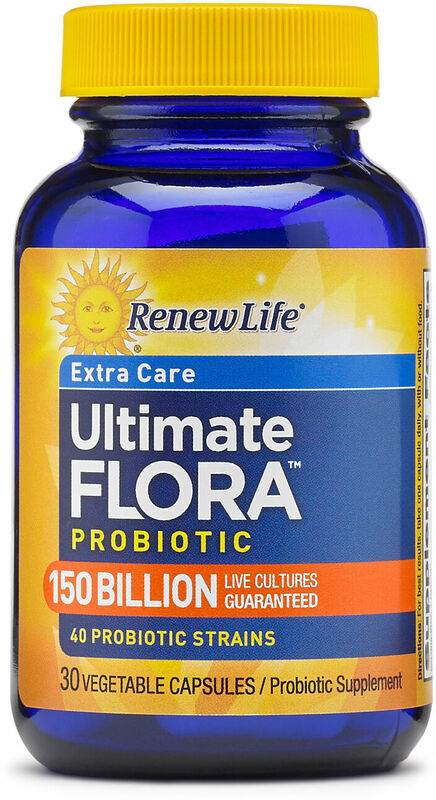 Ultimate Flora is America's #1 High-Potency Probiotic. Each capsule contains 10 different strains of beneficial probiotics (Bifidobacteria and Lactobacilli). Some other brands contain only Bifido or only Lacto. Since you have many strains of probiotics in your intestinal tract, more strains may be better. Ultimate Flora high-potency probiotics promote good digestive health with more live cultures and more probiotic strains in each small capsule.